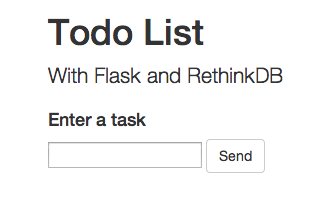 After a number of requests for a basic Flask and RethinkDB template, I decided to go ahead and write a blog post. This is that post. BTW: We always welcome requests. If you have something you’d like us to write about, or build, shoot us an email. 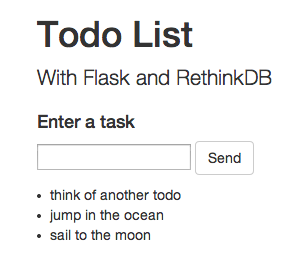 Today we’ll be creating a simple todo list, which you’ll be able to modify to meet your own needs. Before beginning, I highly suggest reading over this article, which details how RethinkDB differs from some of the other NoSQL databases. Note: I installed Rethink globally (outside of a virtualenv) since I’ll probably use the same version with a number of projects, with a number of different languages. We will be installing in within a virtualenv later on in this tutorial. info: by running rethinkdb with the `--bind all` command line option. Exit the Python shell but leave the RethinkDB server running in the other terminal window. Don’t try to submit anything yet, because we need to get a database setup first. Let’s get RethinkDB going. Check the comments for a brief explanation of what each of the functions do. If you see this error rethinkdb.errors.RqlDriverError: Could not connect to localhost:28015. your RethinkDB server is not running. Open up a new terminal window and run $ rethinkdb. 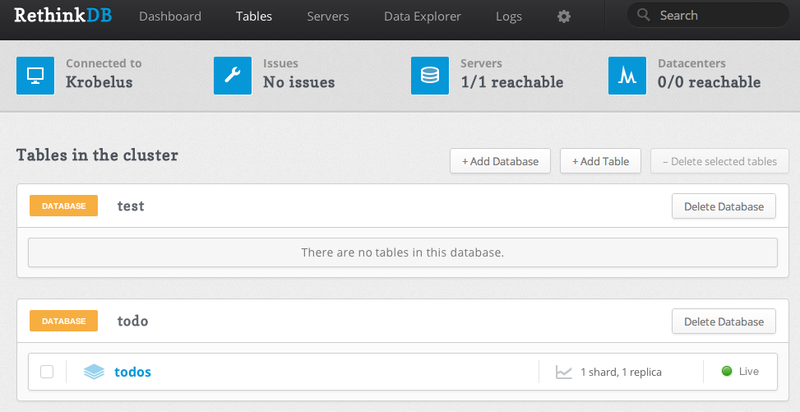 So, we created a new database called “todo”, which has a table called “todos”. Here we’re selecting the “todos” table, pulling all of the data, which is in JSON, and passing the entire table to the template. Before we can view any todos, we need to add some first. Let’s go through the shell and add them in manually. So, we connected to the database, then entered three new objects into the table within the database. Check the API docs for more information. Test this out. Add some todos. Go crazy. The current app is functional, but there’s a lot more we can do. Take this app to the next level. Create a more robust form, where you can add a due date for each todo, and then sort the todos by that date before rendering them to the DOM. Add functional and unit tests. Add the ability to create sub tasks for each task. Read over the API reference docs. Play around with various methods. Refactor the code. Show off your new code to RethinkDB. What else would you like to see? Interested in seeing a part 2? How do you like RethinkDB in comparison to MongoDB? Share your thoughts below. You can grab all the code from the repo. Cheers!